Undoubtedly, the Interim Budget 2019 is going to be the populist one — a budget to lure the common man and regain the waning trust of the middle-class working Indian. However, the Modi government, a favourite of the corporates and startup ecosystem stakeholders, is also known for holding its ground on the schemes and initiatives it has introduced. 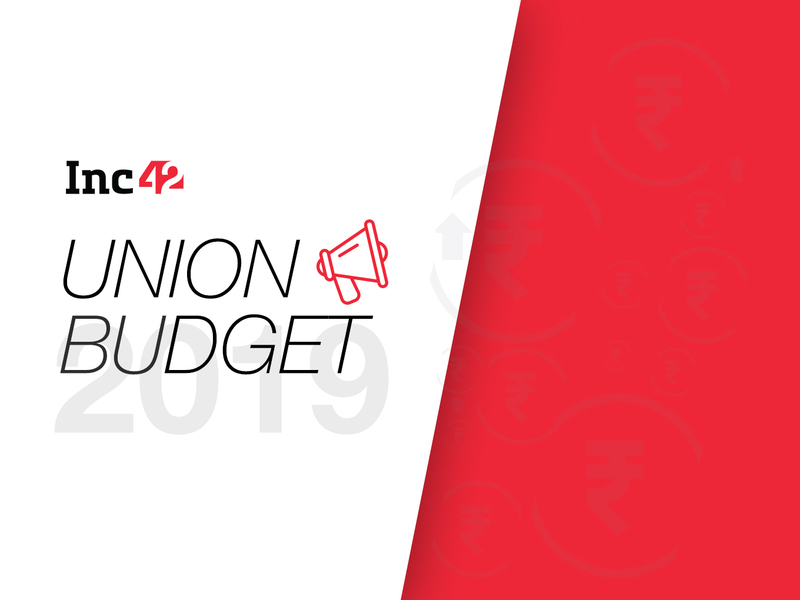 Therefore, the upcoming Budget is going to be a mixed bag, which would attempt to bode well for the Indian startup ecosystem as well as the common man, particularly farmers and the working class. The government is expected to boost its flagship programmes and schemes such as Digital India, Make in India, Startup India, and MUDRA in the Interim Budget 2019 (expected to be vote-on-accounts), to be presented by the interim finance minister Piyush Goyal on February 1. One of the biggest stakeholders in the ecosystem, fintech startups, are waiting with bated breath for the Budget, and they have their views and demands, which Inc42 has collated in this article. “With the Union Budget round the corner, the startup sector is keenly awaiting the policies the government will lay down,” said Kumar Abhishek, CEO and co-founder, ToneTag, a startup that designs cashless and contactless payments solutions. With a total of 3.7 Bn UPI transactions last year, and the December volume standing at 4x of the transactions in January 2018, fintech startups continued their parabolic growth curve. The growth curve of payments startups, in 2018, though, was definitely not the same as was observed in 2017, when digital payments seemed to be on steroids owing to the demonetisation effect. As Aadhaar-enabled eKYC by private companies has been suspended by the Supreme Court and the applicability of the new amendment is limited to the banking and telecom sector only, in this Budget, fintech startups are expecting the government to incentivise sectors such as payments and lending further. According to Bala Parthasarathy, CEO and cofounder, MoneyTap, while Aadhaar-enabled verification will free up banks and finance companies to carry out eKYC and eSign, significantly reducing costs for them, GST slabs may become lower for businesses. According to Abhishek, fintech startups are expecting a faster and easier method for procedural clearance and license approvals. “They are also looking for an increase in allocation of funds towards the adoption of new technologies such as AI and blockchain. With the success of the Digital India scheme, the industry is looking for an allocation of adequate funds to further the cause,” says Abhishek. Increased investments in training, research, and skill development in areas such as big data, IOT, robotics, and other digital tools will act as a facilitator of startup growth, he added. Startups also want easing of unnecessary regulatory supervision and government interference so they can operate without any pressure. Gupta also thinks that the current crisis facing the real estate sector can have a detrimental effect on not just infrastructure development but can result in a far-reaching crisis for the innumerable SMEs who work in the sector as suppliers and vendors to developers. “While the RBI has shown its commitment towards addressing capital requirements of NBFCs in other sectors, it remains to be seen if it will extend a helping hand to the real estate sector by enhancing the financing limit of NBFCs to developers or by providing a refinance window for non-consumer loans by NBFCs,” he adds. The RBI recently agreed to defer Basel III implementation by one more year. This will reportedly expand the lending capacity of Indian banks by $52.24 Bn (INR 3.7 Lakh Crore). So, how can Interim Budget 2019 help boost the lending space and, specifically, tech-oriented lending startups? Rajat Gandhi, founder and CEO of P2P lending startup Faircent.com, opines that to encourage lenders, the finance minister must consider tax exemptions for investments in P2P lending, allowing defaulted loans to be considered as capital loss when filing returns, and providing special tax rebates to lenders who fund loan requirements of MSMEs. “This will increase investments by lenders in P2P lending, unlocking the supply side and thereby putting pressure on rates and easing the current liquidity crunch,” adds Gandhi. Sachdev says that the online lending platforms should also be given access to low-cost funds from government schemes such as MUDRA and the Credit Guarantee Fund Trust for Micro and Small Enterprises (CGTMSE). These funds are only available to banks and NBFCs as of now, and a substantial part of them remains unutilised. SMEs are a key driver of economic growth and providing them access to low-cost funds in a simple, convenient manner will go a long way in enabling them to contribute more meaningfully to the economy and generate employment in the country, he explains. While lending, insurance, and banking are the old monks of the financial services sector, it is the fast-changing digital payments technology, led by startups, which is redefining the terms for the entire sector. The technologies introduced by payments startups are paving the way for the old guard corporates to adopt later. In recent years, digital payments have grown to such a level that the government is now considering making the Payments Regulatory Board (PRB) as independent as the RBI — the PRB is currently under the control of the RBI. There is a sound reason for this move. According to NITI Aayog, the digital payments industry to hit $1 Tn by 2023. In the upcoming Budget, Mathur wishes that the government addresses the angel tax problem. Secondly, considering how the UPI is being embraced by businesses and consumers, resulting in larger transaction volumes and increased P2M (Person-To-Merchant) adoption, it would be good if the government took steps towards making UPI the de-facto mode for all online payments soon, says Mathur. Making RuPay essentially listed in all plastic card-based digital payments and UPI the default payments mode are some of the demands that Indian payments startups have been asking for lately. In the draft ecommerce policy, the government had even proposed to make RuPay card availability at payments gateway mandatory for ecommerce companies. However, the draft is being reworked now. The goods and services tax (GST), which, when introduced, had given sleepless nights to SMEs and startups, has been continuously reformed based on feedback from industries. Angel tax exemption is another area where the government has taken a number of initiatives to safeguard startups. However, it’s not been enough. Startups and angel investors have been demanding some kind of legislative reform to shield startups from Section 56(2)(viib) which embodies the angel tax. He adds that the government must also consider reducing GST rates in the forthcoming budget. Considering the difficulties faced by SMEs in the country, the finance minister is expected to increase the sales threshold for compulsory GST registration from INR 20 lakh to somewhere between INR 50-75 lakh. Further, the government should also look at introducing a concessional tax scheme for small service providers. Mathur avers it is important for the government to recognise the immense potential of fintech lenders in improving financial inclusion and credit penetration in the country. Thereby, the government should encourage them with prudent policies to benefit the sector. “I hope the upcoming budget continues to incorporate new policies and regulations that will create new opportunities and boost our digital payment ecosystem,” says Mathur. Cryptocurrency is another area where the government has not come up with any clear regulation. As of now, the RBI has banned banks and payments companies from extending any services to crypto entities. This move clipped the wings of crypto startups in India even as they were taking off. It resulted in leading crypto companies having to shut shop or relocate. The ones that survived were forced to restrict their services to crypto-to-crypto trading, thereby incurring losses as the transaction volume of crypto-to-crypto is far less than that of fiat-to-crypto. However, in the current scenario, the Garg Committee is unlikely to submit its report on crypto regulation in the country before February end. In other news, more money is expected to be infused in the banking system this Interim Budget 2019. The middle class is also expecting the government to increase the tax exemption threshold from INR 2.5 Lakh ($3.5 K) to INR 5 Lakh ($7 K). At the same time, experts believe that the finance minister might set a revised fiscal deficit target to 3.2% from the existing target of 3.3%. Stay tuned to Inc42 for all the upcoming Budget-related updates!